St. Martin's Griffin, 9781250033840, 416pp. At the turn of the twentieth century two new technologies—the car and airplane—took the nation's imagination by storm as they burst, like comets, into American life. The brave souls that leaped into these dangerous contraptions and pushed them to unexplored extremes became new American heroes: the race car driver and the flying ace. No individual did more to create and intensify these raw new roles than the tall, gangly Eddie Rickenbacker, who defied death over and over with such courage and pluck that a generation of Americans came to know his face better than the president's. 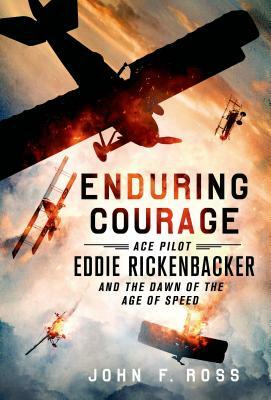 The son of poor, German-speaking Swiss immigrants in Columbus, Ohio, Rickenbacker overcame the specter of his father's violent death, a debilitating handicap, and, later, accusations of being a German spy, to become the American military ace of aces in World War I and a Medal of Honor recipient. He and his high-spirited, all-too-short-lived pilot comrades, created a new kind of aviation warfare, as they pushed their machines to the edge of destruction—and often over it—without parachutes, radios, or radar. Enduring Courage is the electrifying story of the beginning of America's love affair with speed—and how one man above all the rest showed a nation the way forward. No simple daredevil, he was an innovator on the racetrack, a skilled aerial dualist and squadron commander, and founder of Eastern Air Lines. Decades after his heroics against the Red Baron's Flying Circus, he again showed a war-weary nation what it took to survive against nearly insurmountable odds when he and seven others endured a harrowing three-week ordeal adrift without food or water in the Pacific during World War II. For the first time, Enduring Courage peels back the layers of hero to reveal the man himself. With impeccable research and a gripping narrative, John F. Ross tells the unforgettable story of a man who pushed the limits of speed, endurance and courage and emerged as an American legend. JOHN F. ROSS is the author of War on the Run: The Epic Story of Robert Rogers and the Conquest of America's First Frontier. Winner of the Fort Ticonderoga Prize for Contributions to American History, he has served as the Executive Editor of American Heritage and on the Board of Editors at Smithsonian magazine.